← WAVES announces BUTCH VIG VOCALS! 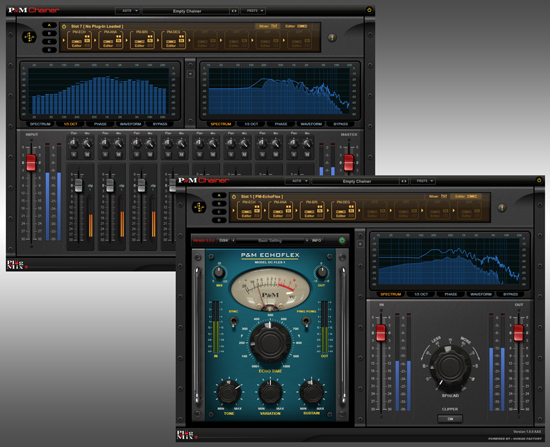 Plug and Mix Launches a VST / VSTi “Chainer” Utility ! In the past months, we have received great amount of requests asking if we could create a useful tool that would contain all 45 P&M V.I.P. Plug-ins making these more convenient to use within any Digital Audio Workstation (DAW). Today we are proud to announce that we have launched a great new product that all of you V.I.P. Plugin owners will love ! We called it, the P&M “Chainer”. It can load and chain P&M plug-ins but it can also…… load VST effects and VSTi instruments into any DAW including Pro Tools ? Waou ! But If you purchase the FULL version, the Chainer will be able to load and “Chain” any VST effects or VSTi instruments making it a powerfull tool to use within any modern DAW including Pro Tools. For example, let’s say you are a guitarist and want to save typical effect patches. The Chainer enables you to load up to 32 effects in series or parallel. So you may want to load and save a compressor, an EQ, an Amp sim, a delay, a reverb, a chorus, etc, and save the whole thing within a patch that can be loaded in other sessions or even other DAWs. The same concept can be applied to vocal patches, drum patches, or any other typical effect chains that you want to recall in future sessions. A time saver ! From today until April 30, the P&M Chainer will be sold at the introductory price od ONLY $49 (MSRP ($129). This entry was posted in Audio Software, Plug & Mix, Plug-ins, Promotions and tagged Chainer, Freeware, Mac, PC, Plug-In, VST. Bookmark the permalink.